This year’s Fleming conference “Sales & Marketing Effectiveness in Chemicals Forum” is coming to Amsterdam on the 24th and 25th October! B2B International is once again a ‘Silver Sponsor’ for this must-attend event for anyone working in sales or marketing in the chemicals industry. The key themes for 2018 include ‘translating B2C examples into B2B success’ and ‘mastering the digital customer journey’ – two topics close to our hearts as customer experience research specialists. Given our expertise in the area, we are delighted that our very own Conor Wilcock has been selected as one of the expert speakers for the two-day event. 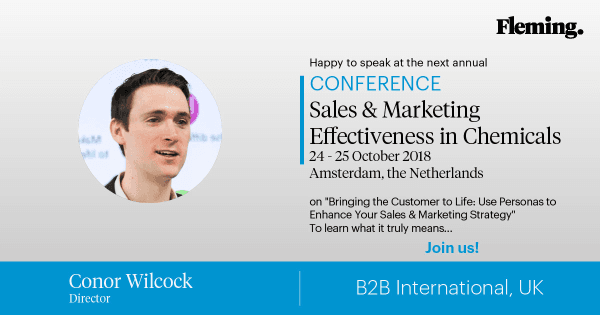 Conor’s talk, “Bringing the Customer to Life: Use Personas to Enhance Your Sales & Marketing Strategy” will take place at 11:15 on Day 1 (24th October). Using various case studies from 20 years of B2B research, Conor will cover the benefits of using personas, the process of creating them and their use in driving positive change within your business. Want to learn more about the event and book your place? Click below for further details.